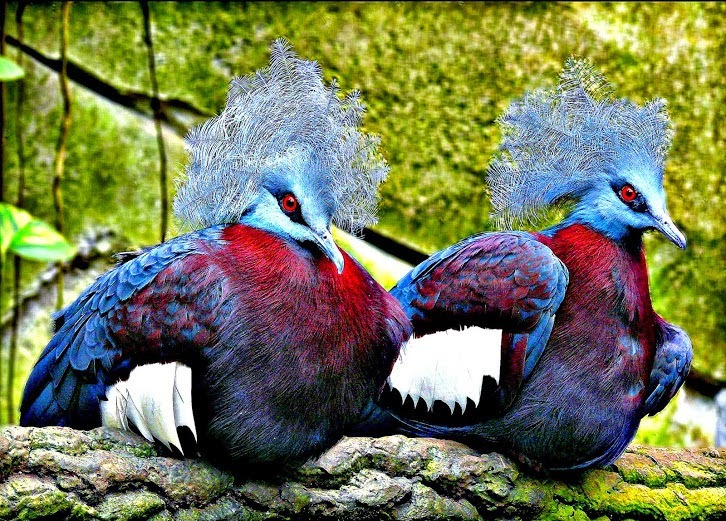 Goura scheepmakeri or Southern Crowned Pigeon is kind Crown is a major ground pigeons that inhabit the lowlands of the southern part of the island of Papua. These birds have feathers blue-grayish with intricate as lace crested blue, red iris, and chest hair dark maroon. Both males and females have the same appearance. Bird, measuring the average length of 70 cm and a weight of 2.25 grams. There are two subspecies of Southern crowned pigeon, distinguished by the color of fur shoulders and stomach. Goura scheepmakeri sclateri in the southwestern region of the island of Papua with maroon shoulder and abdomen blue-gray, and race Goura scheepmakeri in Papua island southeast with shoulder blue-gray and maroon bottom. This bird also looks similar to the relatives Victoria crowned pigeon, and Western crowned pigeon. This species was first introduced to the scientific world by Otto Finsch who found two live birds of endangered species C. Scheepmaker merchant in Amsterdam Zoo zoo and is named after him. Because these birds tame and often hunted for their meat and fur beautiful, these birds are categorized into the endangered species list. Goura victoria is a kind of bird that is found in the bird family Columbidae. 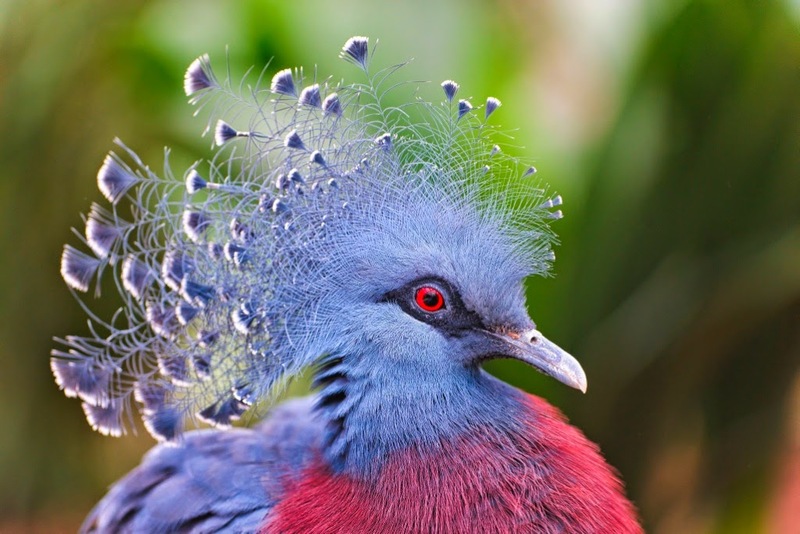 Victoria crowned pigeon is one of three spsies pigeon crown and is the largest species among the types of pigeons. Victoria Mambruk large bird, with a length of 74 cm, and has a blue feather-gray, crested like a fan with a white tip, maroon-purple chest, half gray, dull red legs, and thick lines are gray in wing and tail tip. Around the eyes are black mask with a red iris. Males and females alike. Victoria population scattered in lowland forest, sago forest and swamp forest in the northern part of the island of Papua, which also includes the island of Yapen, Biak Island, and small islands around it. Victoria nesting birds on the branch. Nest made of twigs and leaves. Females usually incubate an egg white. Victoria crowned pigeon is a terrestrial species. These birds forage on the ground. Bird feed Victoria consists of a variety of grains and fruits that fall on the ground. This species usually live in pairs or in groups. The name of this species commemorates a British queen Victoria of the United Kingdom. Victoria crowned pigeon hunted for their meat and fur. This species is rarely found in areas near human populations. Victoria crowned pigeon evaluated as vulnerable in the IUCN Red List. 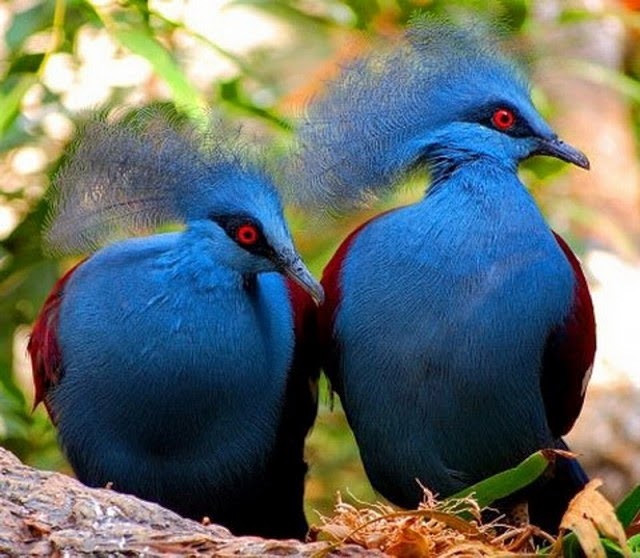 Goura cristata, also known as Western Crowned Pigeon, plain or blue crown, is one of the bird species bird crowns which is colored blue-gray is large enough with a characteristic lace crown on his head and dark fur around his eyes. Both males and females have the same size and shape, but the males are usually larger. Average size is 70 cm long and weighs 2,100 grams. These birds are closely related to Victoria crowned pigeon and Southern crowned pigeon, everything is kind of the largest and most beautiful in the pigeon family (Columbidae). Western crowned pigeon is endemic to Papua Indonesia, because it is only found in lowland rain forest in the western part of the island of Papua in Indonesia, Other types inhabit other parts of the island. The main food of this bird is the fruit and seeds. Papuans hunt these birds are hunted for food and get a beautiful fur and blue. Due to loss of habitat, its distribution is limited and hunting, Western crowned pigeon species categorized as vulnerable in the IUCN Red List of threatened species.